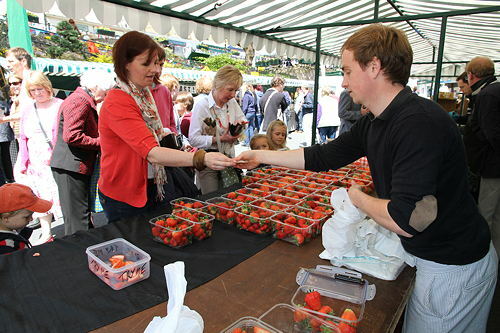 Great Malvern Farmers Market in Abbey Road, starts on Saturday, April 20th 2019, and will then open on the third Saturday of every month (9am – 2pm). BBC Hereford & Worcester presenter Andrew Easton will kindly be doing the honours and declaring it ‘officially open’ at 10.30 am on the day. The new market, which has been well received by the community, is under the guardianship of Boffy Arts Markets, and is supported by Malvern Hills District Council, Three Counties and All About Magazines. Exhibitors already signed up include Lakehouse Brewery, Pork Peddler, The Pudding Shop, Peter Cooks Bread, Salad Revolution, Kelsmor Dairy Ice Cream, Chilli Zoo (pickles), Tudges Meats, Wykeham (plants), Ragged Stone Cider, Lightwood Cheese, Hill Top Farm (pig roast), Yara’s Fudge and Cottage Cakes amongst others. The project has been many months in the making, having undergone total re-branding and re-shaping. Organiser Steve Boffy is looking forward to unveiling the results of a dedicated effort. In the spirit of supporting local business, he has enlisted the help of Tenbury Wells creative consultancy, The M Partnership, to re-design a new brand image and build a website, using beautiful vegetable illustrations by artist Jennifer Chance of Jack In The Green Gallery. Malvern-based PR firm, glasshouse communications has been appointed to manage media relations and social media. “More and more shoppers are literally buying into the premise that locally grown and produced food and drink is best for all sorts of reasons. Aside from supporting local farmers and producers who don’t have the capacity for wide-scale distribution, and helping them to grow and prosper, buying directly means you are guaranteed food with real provenance which has not travelled far. You can be sure that it has been made with fresh, quality ingredients for optimum taste and goodness, and ultimately better health. In a survey by the Campaign to Protect Rural England which asked people why they shopped at farmers markets, one of the most important reasons was to connect with others in the communities where they lived and worked. Respondents felt that the ‘human scale’ of local food shopping; meeting and chatting with producers and other shoppers, helped them learn more about the food they ate and enabled them to give people feedback. They also felt they were making a difference to other people’s lives and local prosperity, and to the quality of the town and countryside around the market. “We want Great Malvern Farmers Market to be a real destination”, added Steve, “somewhere people can meet up with others, connect and enjoy the social side of shopping.